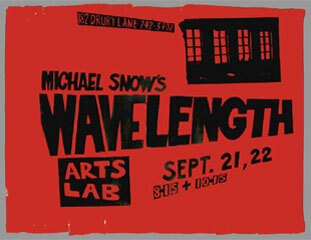 In September 1968, Michael Snow arrived in London for a screening at the Arts Lab on Drury Lane of his breakthrough film Wavelength (1967), which had in the previous year won the 'Grand Prize' at the Knokke Experimental Film Festival. Wavelength comprises a 45-minute camera zoom (although the camera's position does actually advance) through the space of a New York loft apartment. Shot on a variety of film stocks, some out-of-date, and, using a variety of coloured filters, the sequence constantly switches between various times during the day and night. The movement of this film, although seemingly continuous, is perpetually interrupted by changes in film colour and grain and by various events which occur while the camera continues its zoom, such as an unknown man's death and a woman making a phone call. The soundtrack of the film is dominated by a rising sine wave although some location sound and the sound of the Beatles on the radio is also heard. At the culmination of this zoom the camera comes to focus in extreme close-up on a still photograph of waves at sea, fixed to the wall opposite. Snow's film was hailed as a classic of American avant-garde filmmaking (although Snow is actually Canadian), and was influential on a generation of British filmmakers like Mike Dunford, John Du Cane, Annabel Nicholson, Malcolm Le Grice and Guy Sherwin who became associated with Structuralist film. The Structuralist film became identified with work where 'form' was foregrounded over 'content' such as Mike Dunford's Tautology (1973) or John Du Cane's Zoom Lapse (1975).